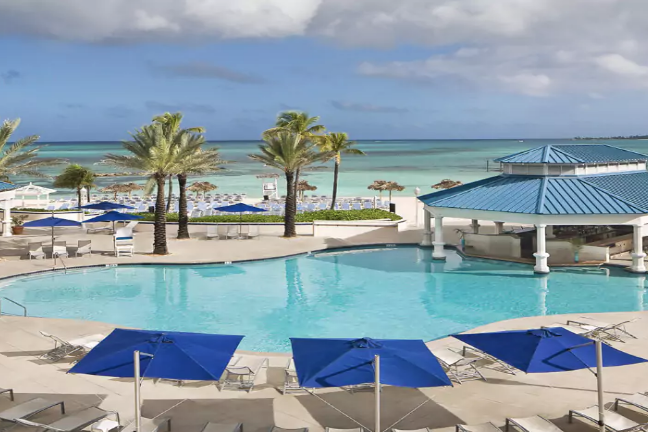 Located on one of the nicest beaches in all of Nassau, this resort rests along a 1,000 foot stretch of the pristine Cable Beach. 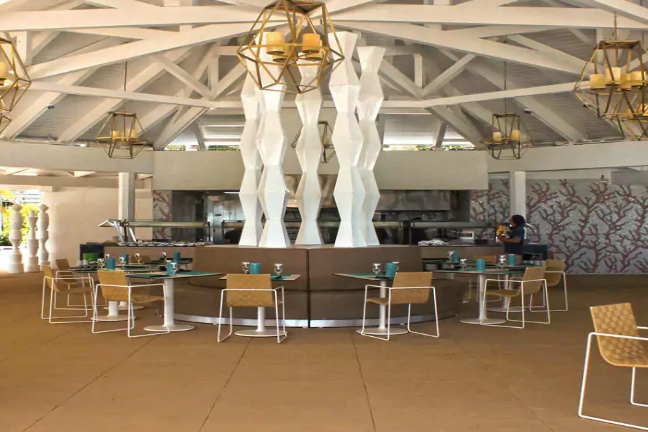 Melia Nassau Beach wedding is a perfect place to unwind and reconnect with your guests and loved ones, as the only all-inclusive family-friendly resort in Nassau. 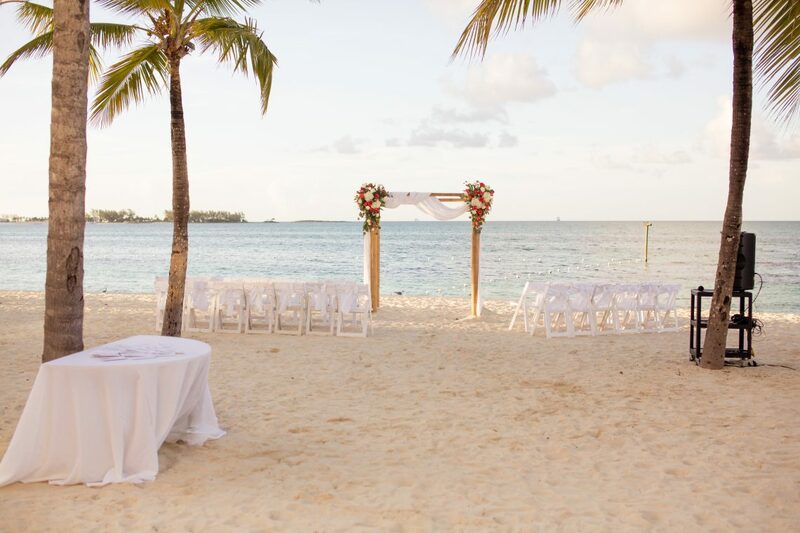 Crystal clear waters and powdery white sand, along with vibrant lush gardens throughout the property, will make your wedding magical, no matter which venue option you choose to host your ceremony at. There is an onsite casino for guests who crave exciting nightlife! The resort offers beautiful sailboats to explore the open ocean and opportunities to see unique wildlife like sea turtles! The resort does not offer every on-site restaurant in the all-inclusive rate, nor do they have a spa. The base price for this package is $799, but complimentary when booking a minimum of 3 rooms in the Premium Garden View room category or a Level Romance Suite for 6 nights or more. Upgraded packages, additional guests, and add-ons are available for an additional cost. Beach – 150 guests max, Patio – 150 guests max, and Terrace – 150 guests max. The resort will host no more than 2 weddings per day, Monday thru Sunday. Ceremonies can be held between 10am and 6pm depending on the season. The wedding coordinators typically respond within 48 hours or longer. During the resort’s busy season, they may take longer. Rooms range from $110 – $160 per person per night. Every room includes a minibar and wifi. Guests staying the Level room categories or higher will receive access to the Level Beach area and the Level Lounge. There are 694 total guest rooms with views of the Atlantic Ocean, pools, gardens, or the resort itself. Although the resort stands 9 stories high, it is handicap accessible and accommodating guest rooms are available upon request. Connecting rooms are also available upon request. High-season months typically include January, April, May, November, and December. It is always encouraged to have your guests book their stay 6 – 12 months in advance. All rooms allow up to 2 adults and 2 children max, or 3 adults. Adults-only rooms will allow 2 adults max. Children are ages 12 and younger. Melia Nassau Beach is located about 6 miles from the NAS airport. The resort is about 20 minutes outside of downtown Nassau. 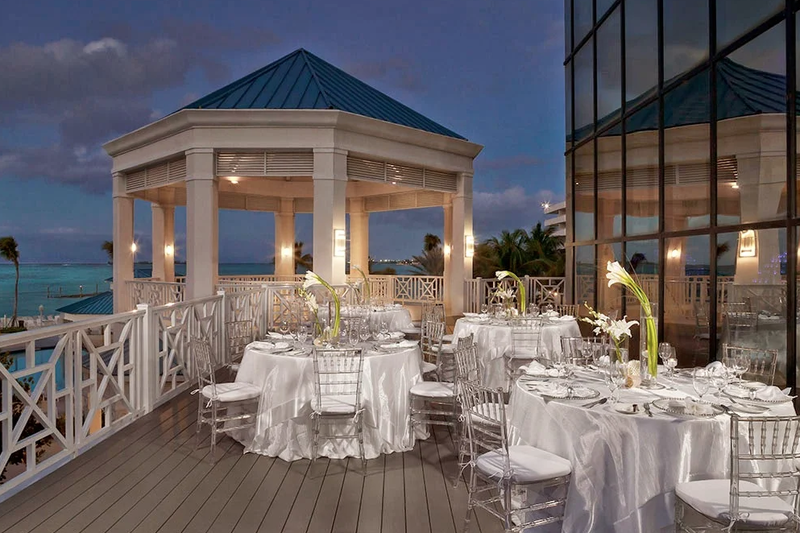 Rooms for a Melia Nassau beach wedding range from $110 – $160 per person per night. Every room includes a minibar and wifi. Guests staying the Level room categories or higher will receive access to the Level Beach area and the Level Lounge. Melia Nassau Beach is located 6 miles from the NAS airport. The resort is about 20 minutes outside of downtown Nassau. 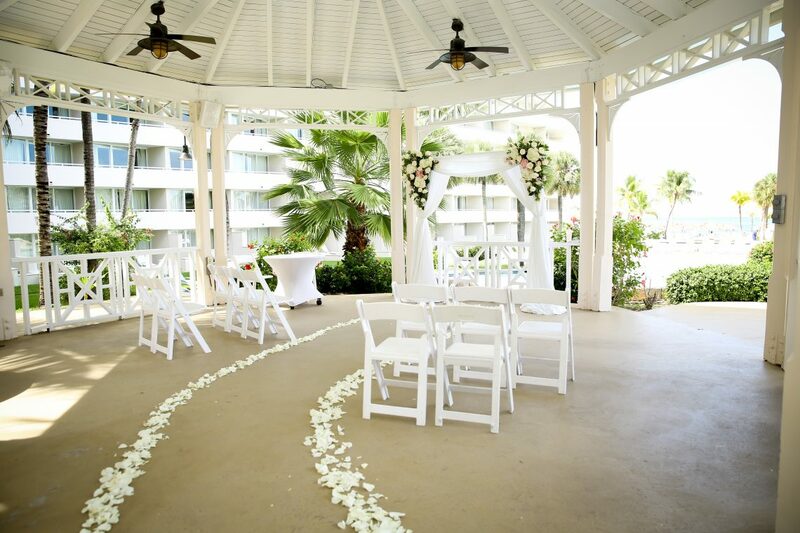 Q: What compliments do brides typically give about Melia Nassau Beach wedding? A: The detailed and excellent service of the wedding department and hotel staff. 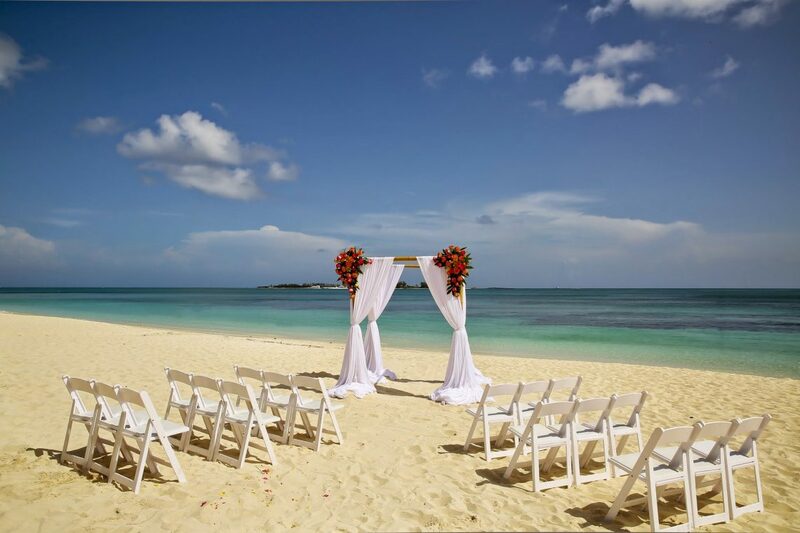 Q: What are the challenges brides face when planning their destination wedding at Melia Nassau Beach? A: Most brides have troubles with getting rooms booked far enough in advance, but once bookings are definite they are no challenges! A: The day of the wedding ceremony is always my favorite! Q: Can you tell us an anecdote about one of your brides when you saved the day? A: We have moved locations for a ceremony five minutes before the ceremony time. It was a rainy day so we went with plan B from the start, and five minutes before the actual ceremony started it stopped raining and it was super sunny, so we were all running around with the chairs and ceremony items, and were able to do the ceremony where it was planned originally.